Thanks to James Kerr for getting this organised - and for getting me quite a long way north of Watford (not that there's anything wrong with Watford, thank you, Julian). The Regal seems a great venue - looks like a former cinema - a community theatre with a capacity of 200 or so, easy reach of both Glasgow and Edinburgh and points all around. It would be good to fit something else into the trip north, but we'll have to see about that. Great news for those of us north of the border! I hope you do manage to fit in another stop while you're up this way. It may be a bit soon for some venues schedules, but any recommendations would be welcome. Tickets to the Regal show on 21st November are now on sale. I know it's a while away, but if you know you are definitely going then I'd encourage you to buy your tickets now as the more that are sold the easier it is for me to build a head of steam locally. The Regal is a great theatre, but part of the same flexibility that allows shows like this to be booked means that the box office and office hours can be a be a bit, let's say, random. Generally if you phone between 11 and 3 you'll be ok. There is an online facility too. Anything anyone can do to spread the word will be much appreciated. Right. That's my tickets booked. Bringing my parents too. This will be the first time they've seen Pete together since Monyash. Now... here's one that won't be on the set list. Any chance of hearing The Pearl Driller on the night? ('tis their song). How are you so sure I'm going to be together?! And yes, i'll be delighted to do Pearl-Driller. I do fish it out sometimes. (Not sure what it says about your parents' relationship, though - unless your Mum drills pearls or looks as if she might. Yes, apparently she had a gold silk jacket when they were first going out. And he's always threatening to pack a few good books and leave. So it works on a number of levels. 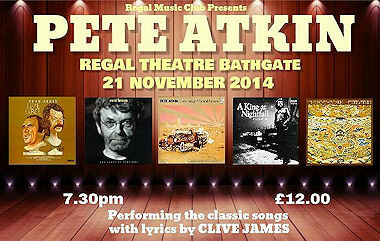 As promised, the Regal Theatre Bathgate was a splendid venue. A former cinema with spectacular decorative panels still in situ on either side of the stage. Pete commented afterward that he thought the sound was terrific, and it was: crystal clear vocals and nicely balanced instruments. The hall was laid out nightclub style rather than theatre, and the small bar remained open throughout, though no clinking glasses or bottles disturbed the songs. There was a good crowd - about 60 I'd guess - many of whom were the Regal Music Club members rather than MVs. Every number was listened to attentively and there was always a slight gap at the end of each song before the applause, allowing the final note to hover then expire. Pete was in good voice, though persistent throat clearings between songs had me worried for a while. I'm sure he would tell us his range is not what it once was, but he more than compensates by delivering the words with so much more expression than was on the original recordings. I was tearing up on "Senior Citizens" just because of the wistful yearning he projected during the performance. He opened with "The Beautiful Changes" which started softly and built to a snarl, giving it more weight than I usually think it has. Next up was "The Pearl Driller", prefaced by an explanation of what talents such a person has. In fact, Pete did quite a lot of talking between numbers, more so than usual but I'm probably comparing it to MV gigs where he can assume we already know what the songs are about. I was a bit concerned when he introduced "Canoe" by describing its structure and, in effect, giving away the trick. However, my brother and his wife who were accompanying me and Yvonne assured me that the found all the expositions very helpful. Throughout the concert Pete was effusive in his praise for Clive and his lyrics and, while he outlined Clive's health problems, he spoke mostly of their early days of writing together and how Clive's early lyrics, such as "You Better Face It Boy" written when he was 28, seemed to presage his older self. After "Me To Thank" and a piano version of "Touch Has A Memory" he introduced the rarely performed "All The Dead Were Strangers" as being a song about war and how it affects people and thus seemed especially relevant in our own time. The second half kicked off with "The Way You Are With Me", a song I'm unfamiliar with but enjoyed which was followed by a slow guitar version of "Carnations on The Roof" which benefited from a more sombre delivery than on the original, somewhat poppy, album version. From there we seemed to slide quickly toward the end: "An Empty Table", "You Better Face It Boy", "Senior Citizens", "Thirty Year Man" and closing with "Laughing Boy". Pete explained Clive's difficulties when singing this song, or any song for that matter, with great affection and humour. He reflected that none of the songs were mown to Australian audiences when they toured there, making performing them a particular delight, and Clive's foray into vocalising always drawing gasps - though what of, we can only imagine. In response to enthusiastic applause and calls for an encore Pete returned to the stage and asked if there were any requests. A quick reply from the front brought forth a perfect version of "Perfect Moments" which summed up the night for me: perfect. Ian, I'm going to share the text of your excellent review on the Regal facebook page, if that is ok with you. Thanks for organising the gig.